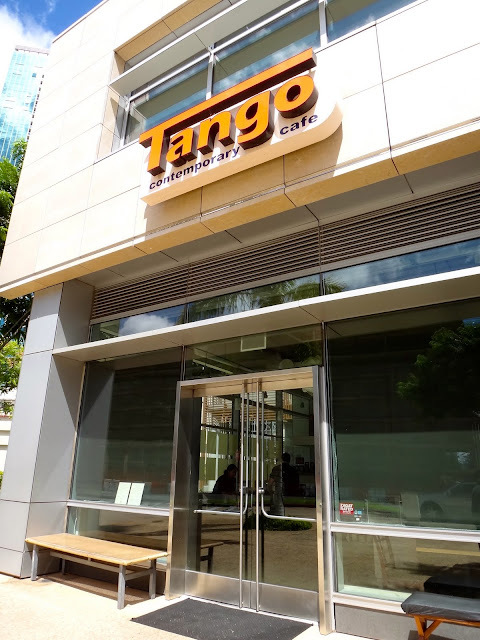 I've been hearing a lot about Tango lately. I went there for lunch a couple years ago (I had their famous Risotto), and wasn't impressed. Wanting to give it a second chance, I took my friend Chad there for lunch. We arrived around 1pm, and was easily sat down. I've heard if you go during peak times, you will definitely have to wait. There was also a lot of hype over their variety of eggs benedict (Traditional, Loco Moco, Smoked Salmon, Crab Hash) only served at Breakfast, but I thought I would sacrifice that for not having to wait for a table. Service was fast and great. Chad and I started off with Italian Sodas- I had peach and he had passion fruit. It was also served with milk, in case you wanted to make it an Italian Cream Soda. About half way through, I poured in some milk... "Interesting," I thought. I think it was better without the milk! Our lunch came a bit after that, and in the end, I wasn't impressed once again. Chad had their Special of the Day- Crab Cake Sand, while I wanted to try their Chef's Famous Gravlox Open-Faced Sand. Gravlox is a salt-cured salmon. If you like smoked salmon, it's worth a try, though for me, I still prefer Smoked Salmon. The Gravlox seemed a bit too raw and mushy for my liking. It was also a damn hard sandwich to eat! I even asked our waiter, John, how the heck most people eat that thing! Most people use a fork and knife, like I did, though, everything just fell off and it all became one big mess! Not my most gracious moment, I must say! I'm sure you could also just pick the dang thing up and eat it like a hot dog! What I was impressed with was their dessert! I almost wanted to order the dessert first because it sounded so delicious! We (or should I say, I) ordered their Strawberry Mango Crumble with Cinnamon Ice Cream. It was so delectable!!! And Cinnamon Ice Cream, need I say more!? The Crumble had a pure balance of sweet and tart with a bit of crunch, that went perfectly with the slightly spicy and creamy ice cream. This is a must-get! Some other details- Parking is located in the Hokua Parking Structure. Just remember to get it validated! Also, different menu items for different parts of the day- different menu for breakfast, lunch and dinner. If I ever decide to go again, I'd definitely want to try their Benedicts, Swedish Pancakes (Plattar), or their Lobster Ravioli. It's a colorful piece of art, but very hard to eat!! Strawberry Mango Crumble with Cinnamon Ice Cream!!!!! Big chunks of strawberry and mango.....YUM!